You want your child to smile with pride and confidence--and so do we! 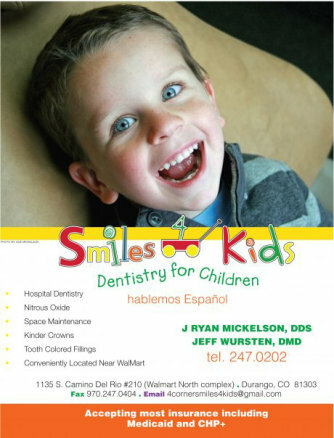 Smiles 4 Kids is Durango’s premier local children’s dentistry practice. We know how to make them smile! We take an approach seated in understanding how kids think and process the world around them. We approach all of our decisions and treatments with the same care and consideration that we would want for our own children. Using a combination of techniques we encourage acclimation to the dental experience from a young age so that your children are more comfortable with dental procedures and treatments from the get-go. Smiles 4 Kids prides itself in fostering a positive relationship with its patients and encouraging lasting habits. We make everything we do understandable to our young patients, helping them recognize everything going on. We have Spanish speaking staff, to help accommodate all of our cherished patients! Please refer to our Behavior Management Form located in our new patient packet, which will need to be signed upon patient intake, to learn about our specific approaches towards children’s dentistry. All services provided by licensed general dentists. These insurances include but not limited to CO and NM Medicaid as well as CHP+. Please contact our office if you have any questions regarding your specific insurance. We offer outpatient treatment in a hospital setting with general anesthesia for patients requiring extensive treatment. A common method used in dentistry also known as "laughing gas." This method is used to help the patient to be more relaxed during their treatment appointment. When teeth need to be removed and space remains, it needs to be maintained to help adult teeth come in where we want them. Space maintainers are used to do just that. These white, stainless-steel, crowns are perfect for front-row teeth for a more aesthetic, natural, appearance. We offer tooth-colored fillings for a more aesthetically pleasing appearance. Serving the Four Corners region, Smiles 4 Kids has two convenient locations. Our Durango office is located in the Walmart Plaza, just south of BODO Park. You can find us in Farmington by the Animas Valley Mall.